Even though I love to cook, I have never seem to have enough time to make everything I want to serve to my guests. I've learned over the years that what makes a party special is not how much I cook, but how much everyone enjoys themselves at the table. A simple antipasti can easily turn into an abundant feast. 1. Antipasti Olives: Serve a mixture of Italian varietal olives right out of the jar, warm them in a saute pan with an orange peel and fresh fennel, or bake in the oven with a chunk of feta cheese, a drizzle of olive oil and squeeze of lemon. 2.Cheese condiments served with a local or artisan cheese: Nothing could be easier! Buy a wedge of cheese from your cheese shop ahead of time. Bring the cheese to room temperature for best flavor then, just before serving, top with a cheese condiment. One of the fan favorites is gorgonzola with caramelized onions and golden raisins. 3. Salumi: La Quercia produces an amazing American-made artisan proscuitto, already sliced and ready to serve. How easy is that? Serve slices neatly arranged on the plate, fold over slices of melon or wrap around grissini breadsticks. 4. Roasted Balsamic Peppers: You can serve these peppers whole on toasted crostini bread slices or with the salumi as a condiment. Either way, its a colorful addition to your antipasti platter. 5. Italian flatbread: Delicate thin sheets of flatbread are delicious brushed with olive and salt or slathered with a fresh arugula pesto. You can even make mini pizzette by topping the flatbread with freshly dressed arugula greens and freshly grated shards of Parmesan cheese. 6. Prosecco! No celebration is complete unless there is something festive and bubbly on the table. For an extra special touch, add a splash of campari or limoncello with a sprig of fresh herbs. Now that you've gotten the food ready, make your presentation as good as what's on the plate. 7. Let the ingredients be the star of the show: I'm not much for decorated plates, so it's no wonder I love the simplicity of a good white platter and other tabletop accessories that show off the food. 8. Less is more: Fewer things on the platter or plate in more abundance makes for an eye-catching appearance on the table. Make it easy on yourself, keep it simple. 9. Have your cocktails at the ready. Once the food is out, it's time for you to relax and enjoy time with your guest. Have your cocktails chilled and glasses on a bar so guests can serve themselves when they arrive and throughout the party. All you have to do is refresh, as needed. And, don't forget to let go and have some fun! Great post! Love your tips! This is a fab idea for the vegetarian Thanksgiving we're doing this weekend here in Canada. 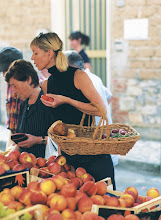 Oh, I wish I was in an Italian hill town market at this moment! 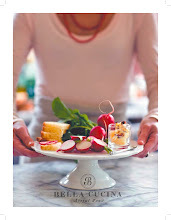 Find out why I am so passionate about Italy: the people, their passion, the FOOD! This travel journal cookbook has over 50 recipes and gorgeous black + white and color photographs. If you've ever been to the charming hill towns of Italy, or some day dream of going, this is the book for you. Click on the picture for more information. Simplicity is a luxury. Passion is a choice. Good Food is sacred.